UPDATE – audio updated so experience can be started at any time of day! 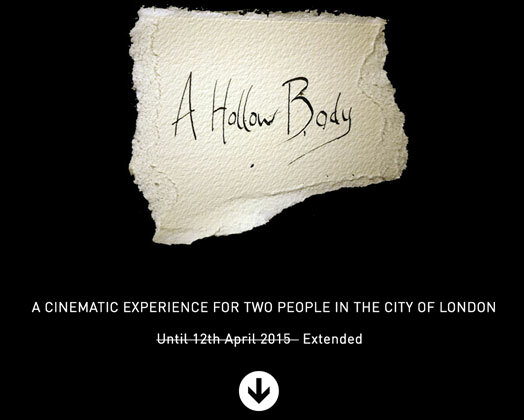 A Hollow Body is a cinematic experience, a soundtrack for the city. An interactive mobile app with specially composed music score and narration guides you and a companion on a journey through the City of London. Commissioned by the Museum of London as part of their Sherlock Holmes exhibition programme, this is not a typical history walk or tourist guide. Imagine walking through a film where you are the main characters; the streets and narrow alleys of London acting as your cinematic backdrop. Find out how to begin your journey on the INSTRUCTIONS page. Special thanks to Phil Smith, Emilie Rolland, Tom Melamed, Jo Reid and all who helped to test and develop the walk.